Mosque, Monghyr (Bihar). View from the river with country boats and budgerow in foreground. bl.uk > Online Gallery Home	> Online exhibitions	> Asia, Pacific and Africa Collections	> Mosque, Monghyr (Bihar). View from the river with country boats and budgerow in foreground. Monghyr is situated on the south bank of the Ganges River in Bihar. From the rule of Akbar in the late 16th century, Monghyr was controlled by the Mughal Emperors. 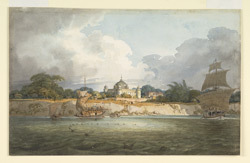 However, Monghyr was also occupied by Mir Qasim, the Nawab of Bengal, during his conflict with the English in the second half of the 18th century. The small sailing ship on the right of the watercolour is a 'budgerow'. These vessels had a long cabin running the length of the boat from the foremast to the stern, which could be divided into separate sections with the aid of partitions. The mosque in this view is made up of a large domed structure surrounded by a high outer wall with domed corner towers.